Debug mode helps those mechs move faster. 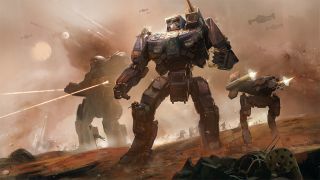 BattleTech is a great tactical mech combat game, but it can be quite a time sink. You can turn off cinematics and follow cameras in the settings menu to help skip between turns more quickly, but it can still take a while to move through a typical engagement. Sometimes I just want to rattle through a mission, grab my salvage, and fly to the next system. Reddit user mruts has a good solution that uses Battletech's debug mode to quintuple mech movement speed. There are other solutions that involve using CheatEngine and modifying text in the file structure, but they tend to affect the game logic, and not just the movement speed of the mechs. The debug console also lets you toggle the speed boost back to normal at any point. Then you double-click the saved file, launch Battletech and press control, shift and the minus key at the same time in battle to summon a little debug menu at the top left of the screen. Click on the 'speed' button to activate 5x mech speed, and then press control, shift and minus again to get rid of the debug menu. Wolf-grey lists this as a solution for Windows 10 users, but I'm using Windows 7 on this PC and it works fine. You can find an alternative method at the top of the reddit post. I've tested it a bit in campaign and skirmish and haven't had any ill effects, but all the usual caveats apply. Back up your save games just in case, there might be unforeseen problems with any tweak you make like this. Also, I haven't tested it in multiplayer either and would expect speed mods to mess with multiplayer synchronicity. I'd love to see the developers add a quickplay option to let us speed up the game using dev-sanctioned methods, but until that, or modders produce the definitive speed mod, this should hopefully help.